Former President Barack Obama warned the world that more people on the planet were eating meat, causing a dramatic rise in climate emissions. “As people want to increase meat consumption, that in turn is spiking the growth of greenhouse emissions coming out of the agricultural sector,” Obama said, pointing to countries that were consuming more meat. 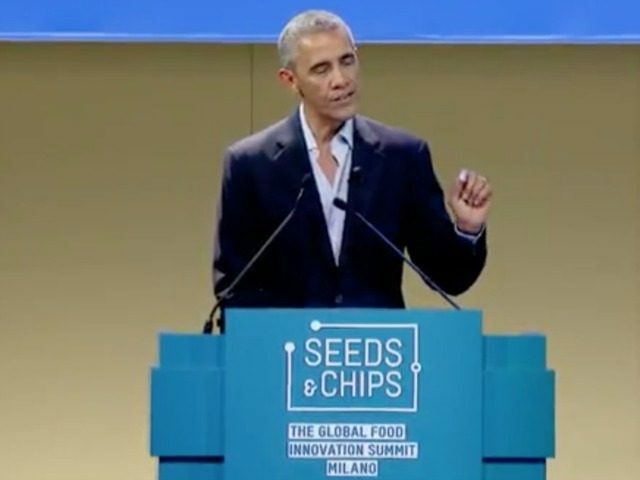 The former president shared his views about the growing threat during a conversation about food with his former chef Sam Kass at a food innovation summit in Milan. The amount of cows, Obama explained, were contributing to global pollution, alluding to the amounts of methane gas emissions from cow herds. “No matter what, we are going to see an increase in meat consumption,” Obama said, pointing to developing economies in China, India, Indonesia, and Vietnam. More advanced countries, Obama said, would have to teach people to “have a smaller steak” and explore reductions to their meat consumption. “What it does mean is that we’re also going to have to find ways to produce protein in a more efficient way,” he said. During the conversation, Obama argued with Kass about how many steaks he had cooked him. Kass said that he probably cooked “thousands of steaks” for the president, but Obama interrupted. “I don’t think, thousands,” he protested. “What is true is that I’m not a vegetarian,” Obama admitted, adding that he “respected vegetarians” but continued to eat meat.